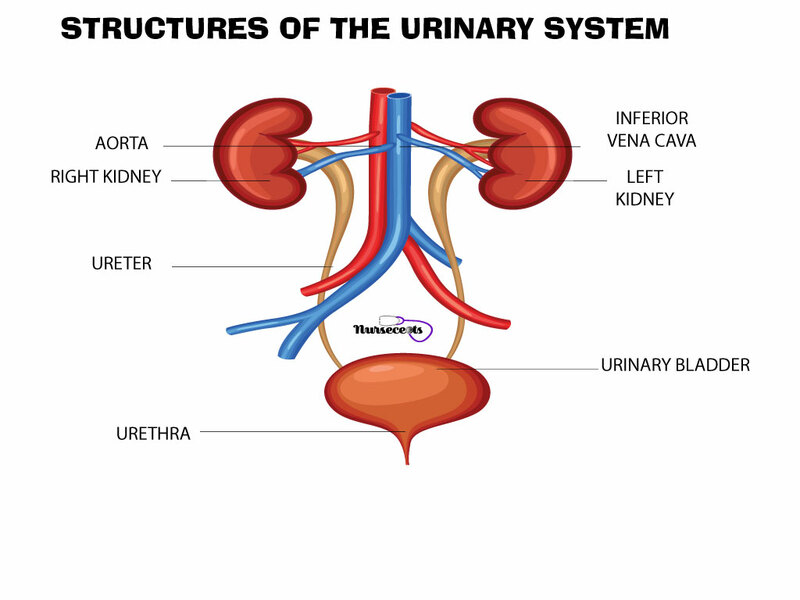 An assessment of the urinary system is used to gather information about the urinary structures and urinary elimination. The nursing student is assessing factors that may affect a patient’s ability to urinate normally. An assessment of the patient’s elimination history, possible symptoms of a urinary problem, and complaints are important. When performing a urinary assessment remember that elimination is a personal and private activity that most patients will not feel comfortable sharing. Make the patient as comfortable as possible and explain the procedure before you begin and as you proceed through the assessment. 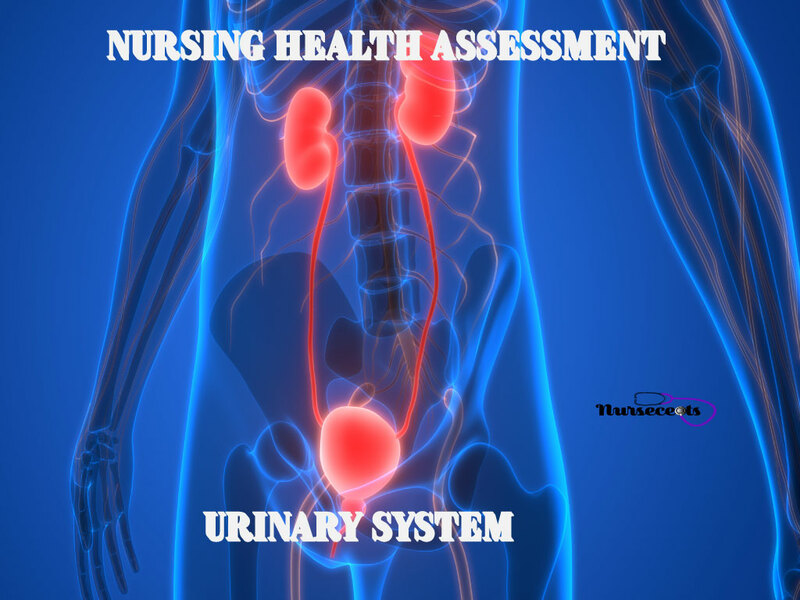 However, there are some procedures included in a physical assessment of the urinary system that student nurses will not perform. Those procedures are mentioned below. 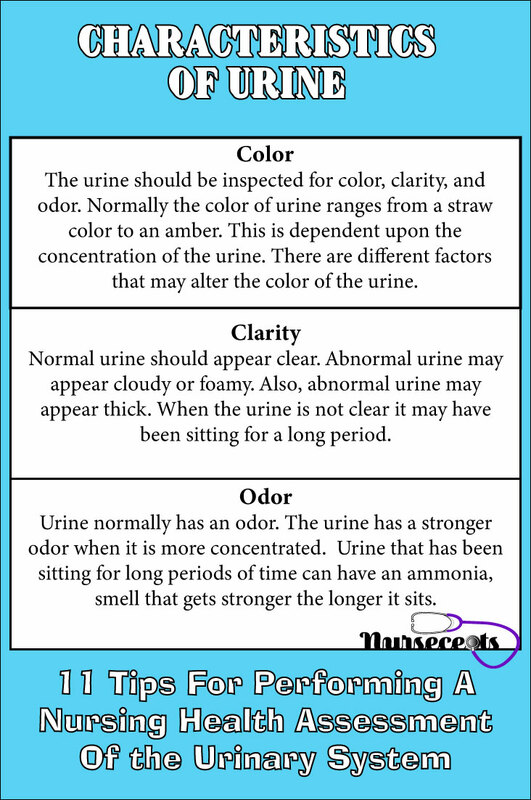 The assessment of urine is included in this article because it is an important skill for a student nurse to learn. To begin the study of assessment of the urinary system, review your anatomy and physiology of the system. 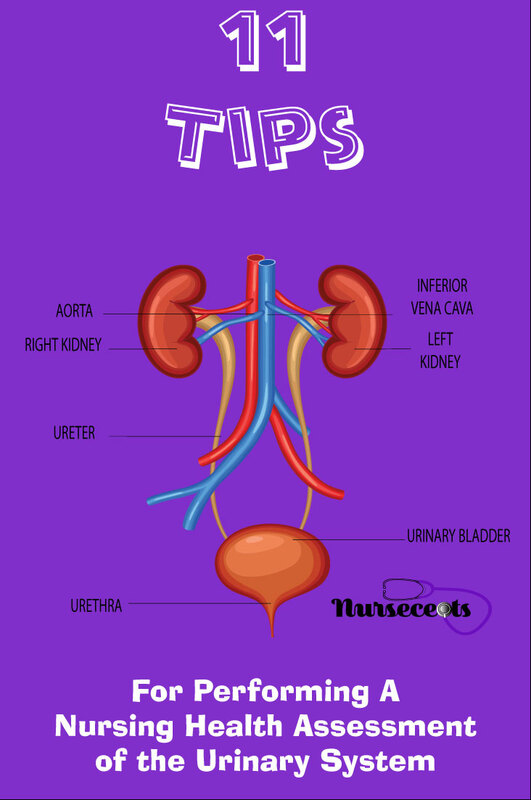 Some helpful facts about the urinary system are included in this article 8 Facts About the Urinary System Every Nursing Student Should Know. During the urinary system assessment, a nursing student will use the skills of inspection, auscultation, percussion, and palpation. 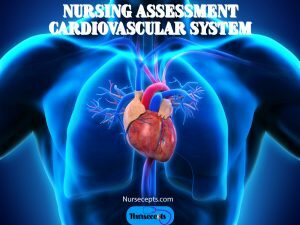 This article contains 11 Helpful Tips for Performing a Nursing Health Assessment of the Urinary System. A patient’s history of elimination includes a review of elimination patterns, elimination symptoms and anything that affects the patient ability to urinate. The assessment will attempt to determine the problem, onset, duration, predisposing factors and the severity of the problem. Ask the patient the following questions. What problems are you having with urination? Have you noticed any change in your pattern of urination? Do you have any difficulty urinating? How much urine do you pass each time you urinate? Do you feel like you empty your bladder when you urinate? Do you have any burning when you urinate? Is there any pain when you urinate? Do you have problems getting to the toilet in time? Have you ever lost control of your urine? Have you noticed a change in the quality of your urine? Has there been a change in the color of your urine? Has your urine been cloudy? Ask women the following question. Do you pass urine involuntarily when you cough, sneeze or laugh? Ask older men the following questions. Has there been a change in the force of the stream of urination? Do you have to strain to urinate? Have you had any problems starting your stream when you urinate? Does your flow of urine stop in the middle of urinating? Do you dribble when you are done urinating? The following are some symptoms that may occur with the urinary system. Gather information about the characteristics and frequency of the symptoms. Also, ask about the onset and duration of the symptoms. 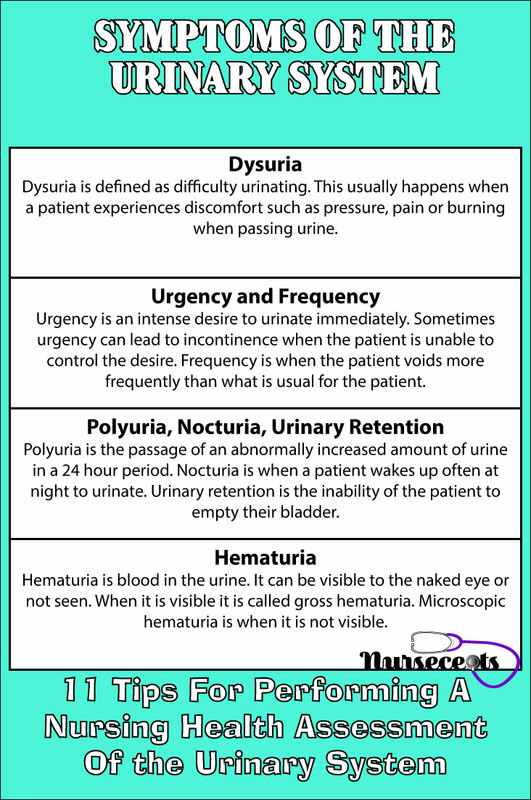 Dysuria is defined as difficulty urinating. This usually happens when a patient experiences discomfort such as pressure, pain or burning when passing urine. Dysuria may be due to a lower urinary tract infection (UTI). Ask the patient the following question related to dysuria. Was the onset of dysuria gradual or did it happen all of a sudden? How long have you had the pressure, pain or burning sensation? Do you have this pressure, pain, or burning sensation each time you urinate? Does the pressure, pain, or burning occur before, during or after urination? Do you feel the pain in any other part of your body? Have you ever had this problem in the past? Have you done anything or taken anything to try to alleviate the symptoms? Was anything effective in relieving the symptoms? Urgency is an intense desire to urinate immediately. Sometimes urgency can lead to incontinence when the patient is unable to control the desire. Frequency is when the patient voids more frequently than what is usual for the patient. Urinary urgency and frequency may occur when there is irritation of the bladder. Ask the patient the following question related to urgency and frequency. Was the onset gradual or did it happen all of a sudden? Approximately how much urine do you pass each time you urinate? Are you able to make it to the bathroom each time? Do you feel any pressure when you urinate? Are you able to completely empty your bladder each time you urinate? Do you have any other symptoms with the urgency and frequency such as pain or burning? How much fluid to drink each day? Polyuria is the passage of an abnormally increased amount of urine in a 24 hour period. Nocturia is when a patient wakes up often at night to urinate. Urinary retention is the inability of the patient to empty their bladder. It can be associated with urinary leakage, dribbling and overflow incontinence. Ask the patient the following questions about polyuria, nocturia, and retention. How many times a day do you urinate? How much urine do you pass when you urinate? What is the approximate amount of fluid you drink in a day? Do you wake at night to urinate? How many times? How much fluid do you drink in the evening? Are there any times that you leak urine? Do you urinate frequently or in small amounts? Hematuria is blood in the urine. It can be visible to the naked eye or not seen. When it is visible it is called gross hematuria. Microscopic hematuria is when it is not visible. Ask the patient the following questions about hematuria. If yes, Do you have any burning with the blood? Do you have any pain with the blood? Have you noticed any clots in your urine? Tip #3 – Know the difference between the types of incontinence. Urinary incontinence is the inability of a patient to control the passage of urine. A patient may be incontinent for different reasons. The different types of urinary incontinence include stress incontinence, urge incontinence, overflow incontinence, and reflex incontinence. A patient may experience stress incontinence when there is a sudden increase in intraabdominal pressure that causes the involuntary passage of urine. This can happen when a patient coughs, sneezes or laughs. It can also happen when a person does heavy lifting and exercise. The patient may find it difficult to hold their urine when they have an urge to void. 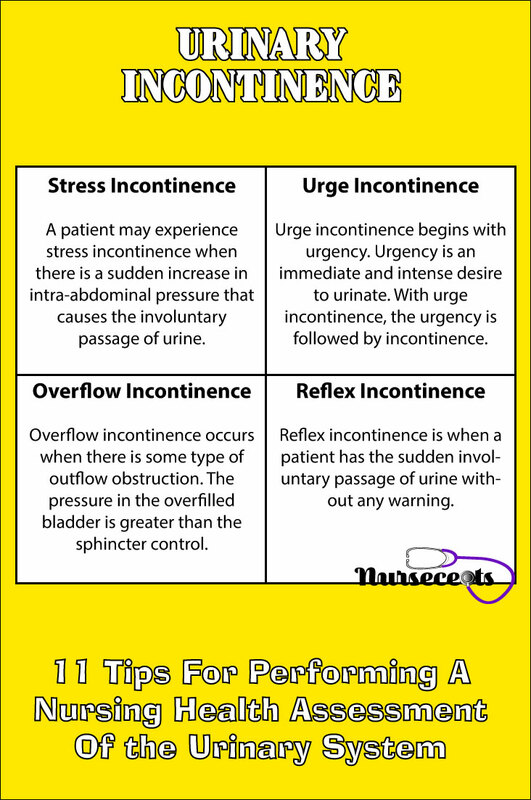 Urge incontinence begins with urgency. Urgency is an immediate and intense desire to urinate. With urge incontinence, the urgency is followed by incontinence. A patient with urge incontinence will usually have frequent leakage of large amounts of urine. This may happen with an overactive bladder. This patient may also experience nocturia. Overflow incontinence occurs when there is some type of outflow obstruction. The pressure in the overfilled bladder is greater than the sphincter control. The patient may leak small amounts of urine during the day and night. The patient may only be able to urinate small amounts. Reflex incontinence is when a patient has the sudden involuntary passage of urine without any warning. The patient may have the passage of urine frequently during the day and night. Disorders of the bladder or urinary tract may cause different types of pain. A patient may experience painful urination, suprapubic pain or flank pain. Suprapubic pain is located in the lower abdomen. Suprapubic pain is most often caused by a disorder of the bladder. This pain is usually a dull pain. It may feel like a pressure in the lower abdomen. Flank pain can be caused by disorders of the urinary tract. 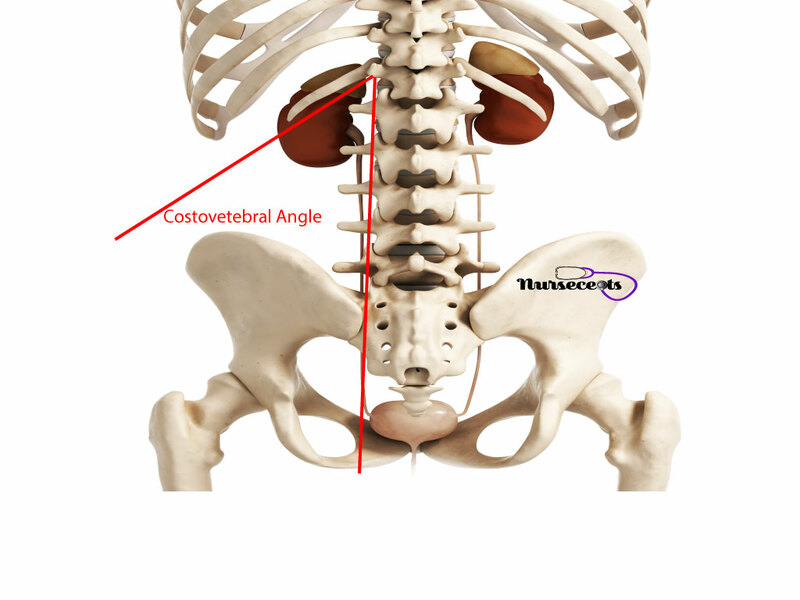 The landmark for flank pain or kidney pain is the costovertebral angle. Kidney pain is usually at or below the costovertebral angle. This is an area of the lower back in which the last rib and the vertebrae intersect causing an angle. This pain is usually a steady, dull, aching visceral pain. Kidney pain may radiate to the front of the body toward the umbilical area. Ask the patient the following questions about pain. Do you have pain before, during or after urination? Do you have burning before, during or after urination? Is there any discomfort before, during or after urination? Do your symptoms occur all the time or just sometimes? Do you notice blood in your urine when you have pain, burning or discomfort? Where does the pain occur? The back? In the flank area? The lower abdomen? The landmarks of the urinary system are the costovertebral angle, the rectus abdominis muscle, and the symphysis pubis. The costovertebral angle is the angle where the vertebrae and the last rib intersect. The lower portion of the kidneys and the ureter are located in this area. 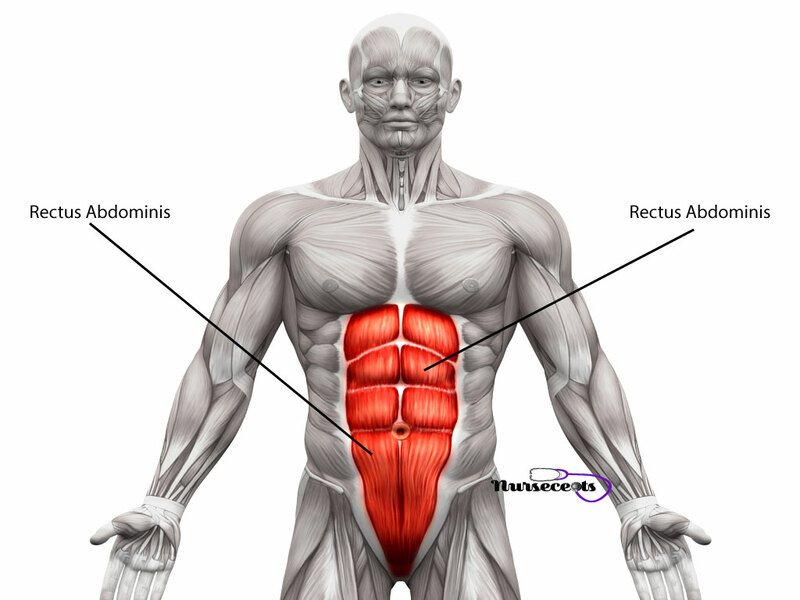 The rectus abdominis muscle is a pair of muscles that extend from the pubic area to the ribcage. They lie on either side of the abdomen next to the midline. These landmarks are used to guide palpation of the kidneys through the abdominal wall. The symphysis pubis is located at the midline where the two pubic bones form a joint. The bladder is cradled in the symphysis pubis. A full bladder will rise above the symphysis pubis towards the umbilicus. Before you begin your assessment, be sure to have the patient empty their bladder. Remember to make the patient as comfortable as possible and explain the procedure before you begin and as you proceed through the assessment. Tip #6 – Inspection the Abdomen. Position the patient in a lying (supine) position with the abdomen exposed. Assess the general appearance of the abdomen. Check the abdomen for any bulges, masses or indentations. Check the suprapubic area for distention. There should normally be no distention. First of all, position the patient in a sitting position. Assess the costovertebral area for discoloration and symmetry. Assess the flank area for discoloration and symmetry. Inspect the area for any masses. An abnormally enlarged kidney could cause a mass. Tip #8 – Palpation and Percuss the Costovertebral Area. If the patient complains of pain or discomfort or has a diagnosis of a possible tumor, do not palpate or percuss the abdominal or pelvic area. To begin, palpate over the left and right costovertebral area. Watch the patient for signs of pain or discomfort when you palpate. The patient should show no signs of discomfort. You may use indirect or blunt percussion to assess the kidneys. To percuss the kidney, place the palm of your hand over the costovertebral angle. Thump the back of your hand with the fist of your other hand. This will cause a thud noise. The renal arteries are located above the umbilical area on the abdomen. Extend the midclavicular line on the right or left side to the epigastric area. Listen with the bell of the stethoscope over the extended line. There should be no sound heard. The kidney can be further assessed by palpation and attempting to capture the kidney. However, these procedures should not be attempted by a student nurse. This is one of those instances in which the procedure is done by a physician or an advanced practitioner. First, position the patient in a lying (supine) position. Begin with light palpation in the lower abdominal area. The abdomen should be soft. Use deep palpation to locate the base of the bladder. This is below the umbilicus in the lower abdomen. Once you have found the bladder, continue to palpate outlining the bladder. You are noting the shape and contour of the bladder. If a patient has any additional adipose tissue to the lower abdominal area, two hands may be required. This method is called bimanual palpation. The bladder should be smooth and continuous. An empty bladder is not palpable. A bladder which is slightly full is firm and non-tender. A bladder that is full is usually palpated at a higher level on the abdomen. A full bladder will feel firm. The assessment of urine involves the measurement of the patients fluid intake and output and also observing the characteristics of the urine. An alteration in a patient’s volume of urine can be an indication of the amount of fluid a patient is taking in or a problem with the kidneys. Therefore, the measurement of urine is important. 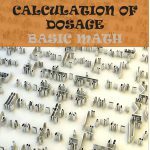 Measurement of the patient’s intake and output is usually done when the physician writes an order to measure I&O. This means you should measure the amount of fluid the patient takes in orally and intravenously in a 24 hour period. And, measure the amount of output within the same 24 hour period. The nursing student may measure urine using different methods. For a patient who is continent, you may use different types of receptacles. There are receptacles that can be used with the toilet, or a bedpan or a urinal can be used. Some patients may have an indwelling catheter with a drainage bag. The drainage bag may be used to measure the urine. However, draining the urine into a graduated receptacle is a more accurate way of measuring urine output. The nursing student should evaluate the characteristics of the urine. The urine should be inspected for color, clarity, and odor. Normally the color of urine ranges from a straw color to an amber. This is dependent upon the concentration of the urine. There are different factors that may alter the color of the urine. Urine can vary from dark amber to bright red when altered. Bright and dark red urine can mean blood in the urine that originates anywhere from the kidneys to the urethra. The higher up the bleeding is occurring, the darker the red color of the urine. Also, foods and medications can alter the color of the urine. And, disease process such as liver disease can alter the color of urine. If a patient has urine that is an abnormal color, check the patient records and document and report your findings. Secondly, the nursing student should also check the clarity of the urine. Normal urine should appear clear. Abnormal urine may appear cloudy or foamy. Also, abnormal urine may appear thick. When the urine is not clear it may have been sitting for a long period. Urine may also appear abnormal in a patient with renal disease or when the urine contains sediment such as bacteria or white blood cells. Finally, the nursing student should assess the urine for odor. Urine normally has an odor. The urine has a stronger odor when it is more concentrated. Urine that has been sitting for long periods of time can have an ammonia, smell that gets stronger the longer it sits. If the urine contains bacteria and sits for a long time, the odor can become unpleasant. The odor of urine distinguishes certain diseases. For example, a patient who is diabetic may have urine that smells sweet or fruity from incomplete fat metabolism. 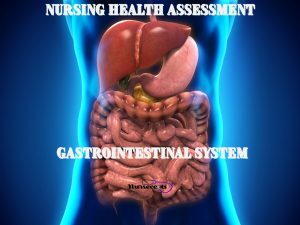 In conclusion, the tips above will help you with a nursing health assessment of the urinary system. The patient history, palpation of the bladder and the assessment of the urine are skills the nursing student will constantly use during their clinical rotations. These are just a few tips to help improve your assessment skills of the urinary system. 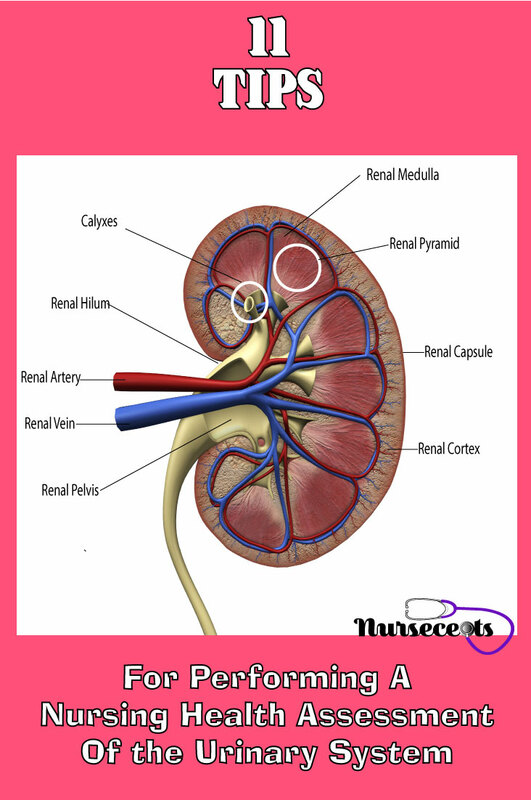 Previous Post8 Facts About The Urinary System Every Nursing Student Should Know.